Filed to: iceberg right ahead!Filed to: iceberg right ahead! Back in July, satellite images showed an iceberg bigger than the state of Delaware calving and drifting away from Antarctica’s Larsen C ice shelf. Well, it’s summertime now in Antarctica, which means scientists are finally able to view this behemoth from up close—and the pictures are just as spectacular as we imagined. Known as iceberg A-68, the gigantic slab of ice weighs about a trillion tons and features a surface area of 2,240 square miles (5,800 square kilometers). The berg is slowly drifting away from the Larsen C ice shelf, possibly heading towards the South Georgia and South Sandwich Islands. 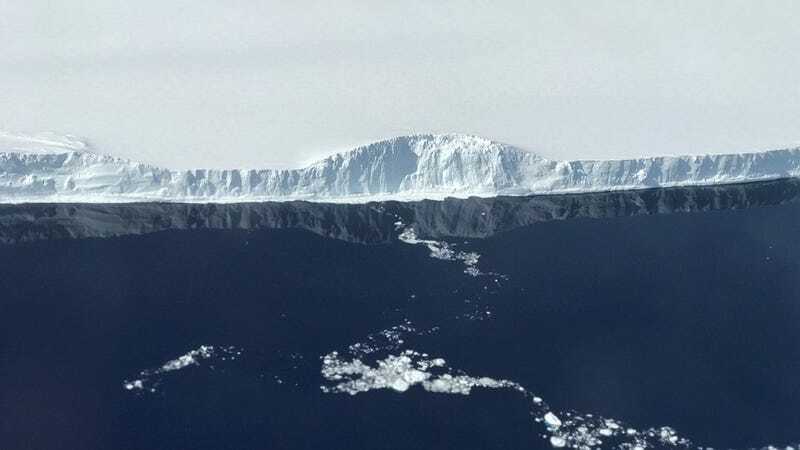 As it floats away from the Antarctic Peninsula, A-68 is splintering and forming more icebergs in the process. This past Sunday November 12th, members of Operation Icebridge—a NASA-led initiative to produce detailed 3D maps of Antarctic and Arctic polar ice—flew a P-3 aircraft armed with a sophisticated array of measuring instruments to take a closer look. Hansen said she wasn’t prepared for the enormity of the iceberg, as most bergs she’s seen were relatively small and blocky. In addition to taking photos, the Operational Icebridge scientists sought to measure the depth of water below iceberg, which they did using radar and a gravimeter. Scientists now have the clearest picture yet of A-68, which will help them track and study its progress moving forward. Is Antarctica’s Scarred Seafloor a Harbinger of Trouble to Come?